This Professional Woodworking 25 piece Brad Point Drill Bit set helps provide accurate positioning for starting the hole. The Bits are precision ground for use in furniture making, doweling, cabinetry, and other woodworking applications where an exact hole size is required. Also, spur cutting edges reduce splintering and ensure a smooth, clean hole and the wide flutes provide a fast, continuous flow of chips. Sizes: 1/8", 9/64", 5/32", 11/64", 3/16", 13/64", 7/32", 15/64", 1/4", 17/64", 9/32", 19/64", 5/16", 21/64", 11/32", 23/64", 3/8", 25/64", 13/32", 27/64", 7/16", 29/64", 15/32", 31/64", 1/2"
Manufactured from industrial grade steel, this set includes 34 different bits for versatility, plus a magnetic holder to keep them in place while being used. Their durable materials ensure these bits can withstand heavy-duty torque and always get the job done. The solid storage case makes organizing and transporting the bits, either home or to the next job site, a breeze. Professional Woodworker 25pc Brad Point Drill Bit Set This Professional Woodworking 25 piece Brad Point Drill Bit set helps provide accurate positioning for starting the hole. The Bits are precision ground for use in furniture making, doweling, cabinetry, and other woodworking applications where an exact hole size is required. Also, spur cutting edges reduce splintering and ensure a smooth, clean hole and the wide flutes provide a fast, continuous flow of chips. Professional Woodworker 25pc Brad Point Drill Bit Set is rated 3.0 out of 5 by 19. Rated 2 out of 5 by Bacon from Not what I hoped for I realized that there is a reason these bits are inexpensive. They are not straight and have a wobble. Rated 1 out of 5 by aaaa from Absolute garbage But then what did you expect at this price anyway? Rated 4 out of 5 by DFRetired from Drill set meets all my expectations. The drills are sharp and a great selection for the price. ... Drill set meets all my expectations. 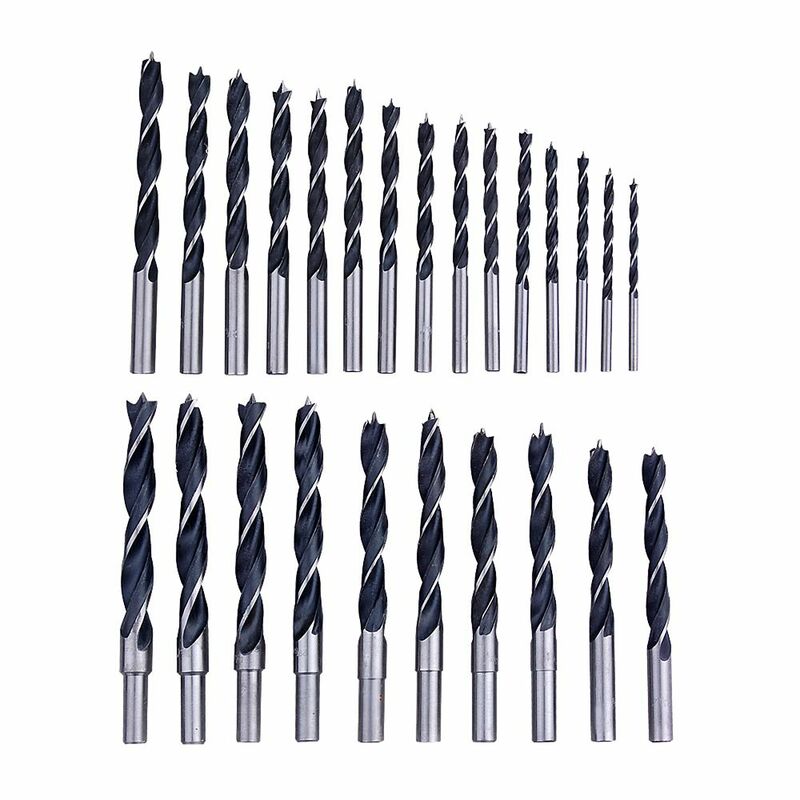 The drills are sharp and a great selection for the price. I've had them a week and they are some much more accurate in wood than standard twist drills. The case is very cheap, that's the reason for the 4 stars but serviceable. Rated 1 out of 5 by HomeL from If you are tempted by the price, Don't. This is an item that you should only be able find from flea markets. Out of the whole box of drill bits I could not find one that is usable. None of them are straight and none of them are ground properly. Don not let the label "Professional Woodworker" fool you. They are nothing but. Rated 4 out of 5 by Carl from Great set of bits. I wish they had the sizes... Great set of bits. I wish they had the sizes printed on the case, the sizes on the bits are very small and it would make it much easier to find what you’re looking for. Rated 4 out of 5 by Andy from I wanted brad point drill bits and I got exactly... I wanted brad point drill bits and I got exactly what I expected. Rated 5 out of 5 by Bennett from Has a wide and varied selection of sizes, such as the 17/64" bit. Has a wide and varied selection of sizes, such as the 17/64" bit.